From before the sun rises until after the sun goes down, or fourteen hours, I’m at my job here in Japan. Because I get back to the hotel so late regular restaurants are closed, both convention franchise as well as local mom-and-pop businesses. 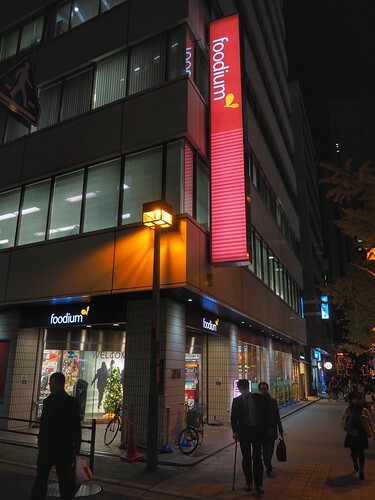 So my Plan B for getting something for supper is to walk about two blocks to a 24-hour combined grocery and little restaurant called foodium. I don’t know if it’s a Japanese language idiom or not; the name sounds like something that would come straight out of the Valley. The foodium has become my one way of breaking the monotonous cycle of sleep-shower-breakfast-work-sleep. And it gives me an opportunity to walk about a bit as well, even if it is at night. The interior is well lit and very modern, just about what you’d expect in an American supermarket. The panoramic should give some idea of one corner of the store. 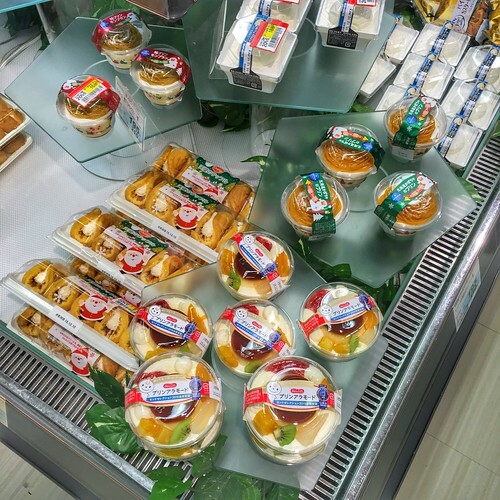 It’s packed full of modern packaged Japanese food items, a lot of it highly processed. Some of the items have a western Christmas/Yuletide theme. The Japanese, for whatever reasons, are very much into Christmas. You can’t go anywhere without hearing western Christmas music being piped into stores and train stations. 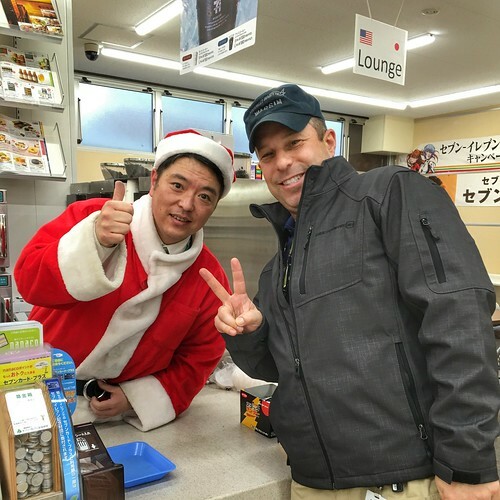 The Japanese will even dress the part during Christmas, as the photo above illustrates. Japan is an interesting culture, one that combines aspects of theirs and ours in interesting and complex ways. The top photo was taken with an OM-D E-M10 and Panasonic 14mm pancake lens. The rest were taken with the iPhone 6s+. The camera in the iPhone is truly powerful with capabilities I’ve barely learned to tap. The ability to take panoramic photos, like the second, is so simple to do and the results are actually worth keeping. I wish Olympus were as easy to use making panoramics as the iPhone. The E-M10 JPEG images were moved onto the iPad using OI.Share. All post processing was done on either the iPhone or the iPad using Snapseed. anthropomorphization: noun: attributing human characteristics to something that is nonhuman (like an animal, such as a cat). We pet owners are a funny breed (non pun intended). 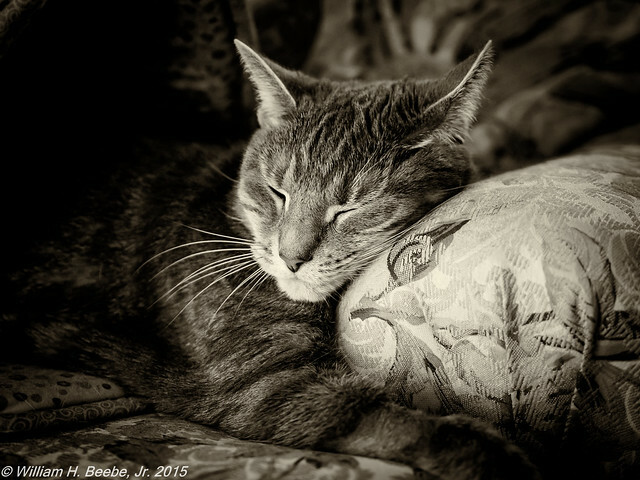 We ascribe all sorts of human qualities to our animals. And how can we not, when we see them doing something not just human, but so very child-like? Lulu likes to sleep on the arm of the stuffed chair, with one paw stretched out and around the bottom. Kind of like a kid with a pillow. What makes this one particularly special is that the light came from the Christmas tree lights. Lulu has an affinity for that tree, more than the other two cats.